Chill. Aerate. Pour. Meet the next generation of cool. Forged out of stainless steel with Corkcicle’s signature icicle look, Corkcicle ONE includes a new pour through feature, as well as a state-of-the-art aerator that instantly expands the aromatic profile of your wine as you pour. Like its Corkcicle predecessor, Corkcicle ONE cools down room-temp reds and maintains chilled whites at the perfect temperature for up to an hour. Using a unique thermal gel combined with the powerful cooling properties of stainless steel, Corkcicle ONE provides perfectly chilled whites and reds. The only one of its kind, this amazing aerator will bring instant balance to your wine and draw out the properties gained from decanting or “letting it breath” immediately when pouring into the glass. The convenience factor means you don’t need to remove Corkcicle ONE from the bottle to pour. Leave it in and simply tilt the bottle to pour wine right through Corkcicle ONE. The flip cap allows for a complete seal that ensures the chilling achieves its maximum potential and no cold escapes. Carve out a small spot in your freezer for Corkcicle ONE with the included beautiful freezing case. The case will keep frost and condensation from building up on the metal while being frozen. 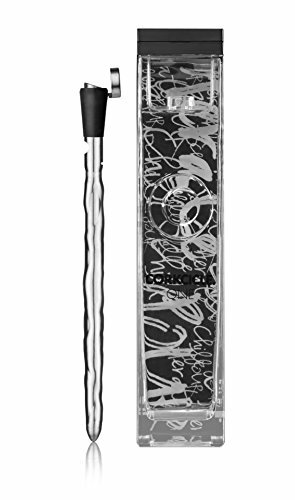 Corkcicle ONE also makes a great gift for the wine enthusiast.